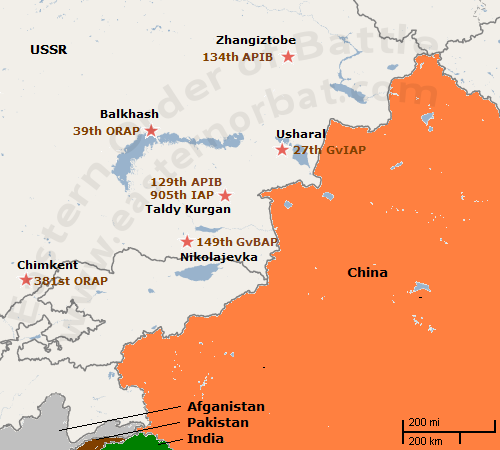 The Soviet Central Asian Military District had two army corps in the seventies. 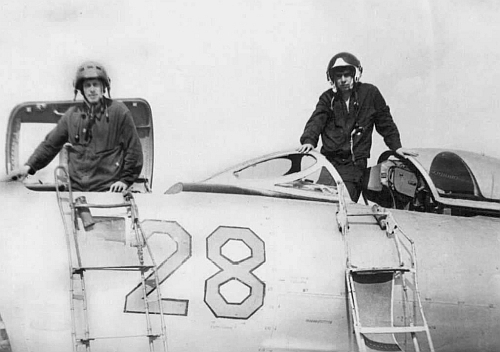 The air support of these was performed by two mixed air divisions. The 1st Army Corps – 10th Mixed Air Division and 17th Army Corps – 24th Mixed Air Division. 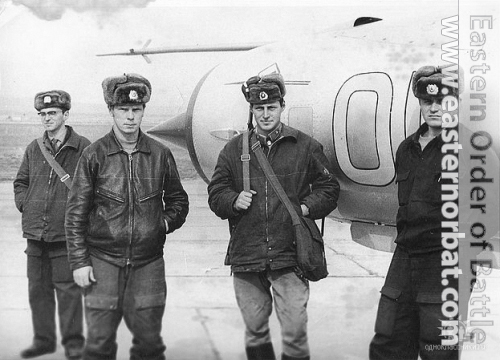 The 905th Fighter Air Regiment’s crews in front of theirs silver colour MiG-21SMT Fishbed-K at Taldy Kurgan air base. 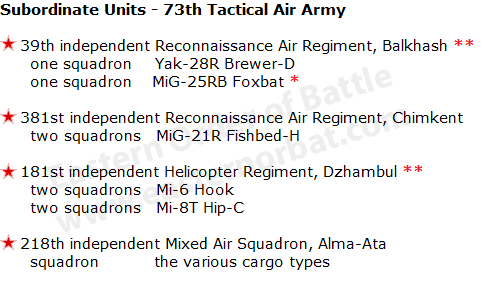 Between 1973 and 1975, primarily fighter forces were modernized. The 27th Guard Fighter Air Regiment received MiG-21bis Fishbed-L, while the 905th Fighter Air Regiment received MiG-21SMT Fishbed-K fighter type. 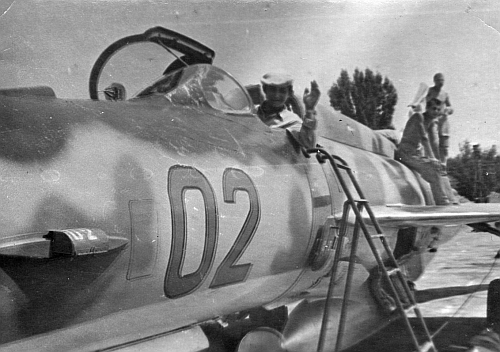 The 905th regiment used two different MiG-21SMT Fishbed-K sub-variants. The second squadron used the humpback larger saddle tank variant (Izdeliye 50), while the first and third squadrons used the smaller saddle tank variant (Izdeliye 50bis). Some Western sources refer to it as the MiG-21ST. Around 1980 the machines were painted camouflage. 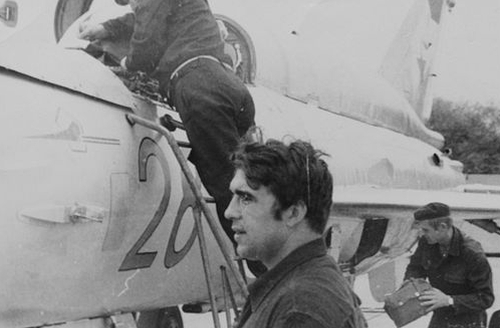 From 1975, bomber forces replaced their MiG-17s. 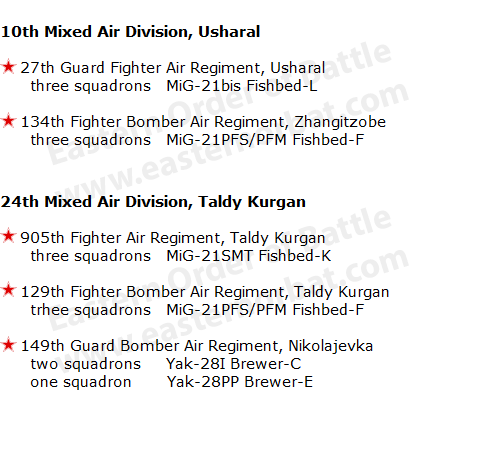 The 134th and the 129th regiments received old MiG-21PFS and PFM Fishbed-F fighter-bomber types, while the 149th guard regiment received used Yak-28I Brewer-C bombers. These old models were sufficient at the Sino-Soviet border. 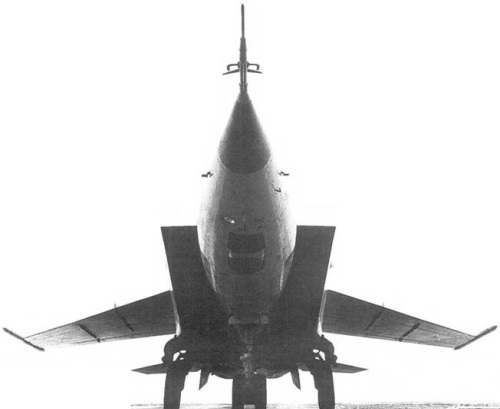 The 39th ORAP received high-speed MiG-25RB Foxbat reconnaissance aircraft. The 39th Regiment was part of the scouting network settled around China. In 1973, a new helicopter regiment was formed at Dzhambul airport with two Mi-6 Hook heavy and two Mi-8 Hip medium transport squadron.